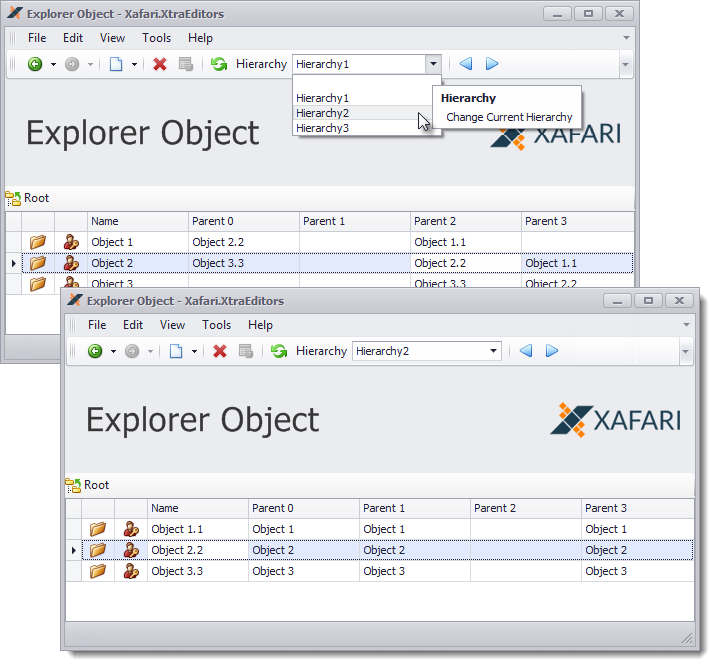 Explorer List Editor displays objects that implement the IHierarchyNode interface. It displays the data hierarchy as a nested folders structure and visually looks like Windows Explorer (therefore the name). Explorer List Editor was implemented especially to support IHierarchyNode interface and provides efficient queries to retrieve data. To use this editor you need to implement IHierarchyNode interface. You can see the implementation in the Xafari.XtraEditors.Module | Editors| ExplorerObject.cs file of the Xafari XtraEditors demo installed with the product. 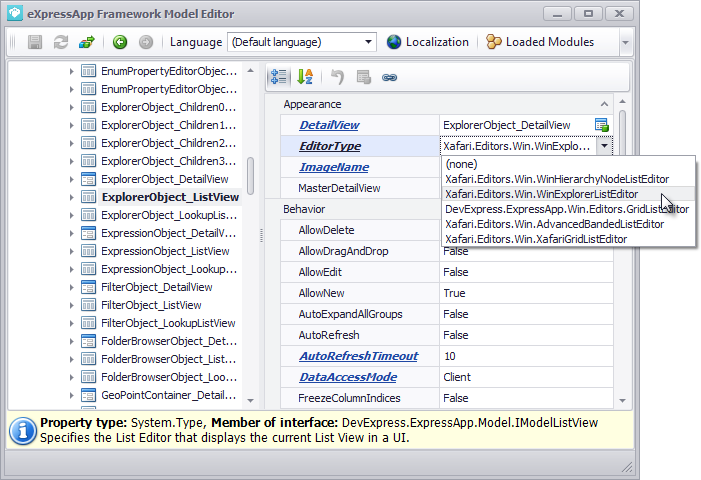 Once the hierarchy is implemented, invoke Model Editor and focus the corresponding Views|…_ListView node, set PropertyEditorType property to the WinExplorerListEditor (or ASPxExplorerListEditor) value. Run a Windows Forms or ASP.NET application and invoke corresponding Detail View. 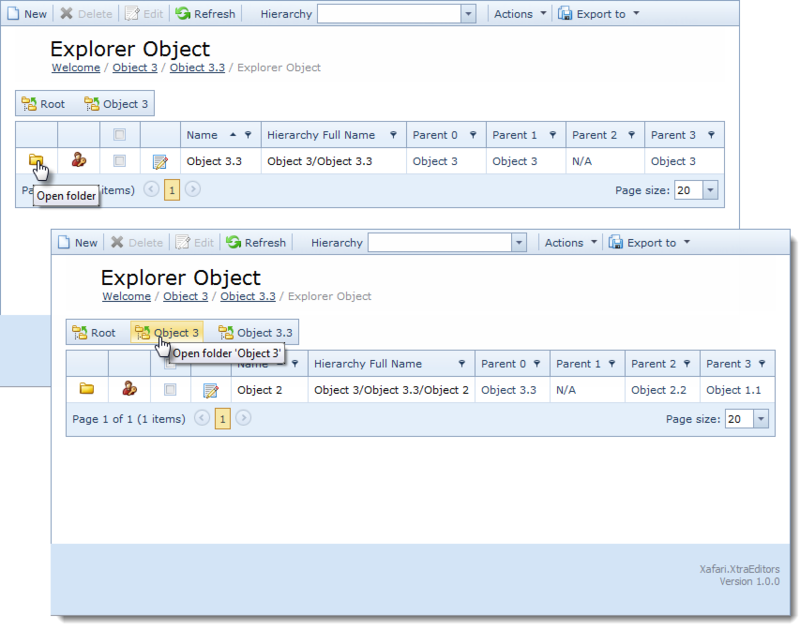 One feature of the Explorer List Editor is a support for multiple hierarchies. The user can change the current hierarchy at runtime via a special popup control located within main toolbar. To see the children nodes, open the nested folder. To go back to one of the parent nodes, use a sequence of buttons above the List View.